This set of napkin rings are the most gorgeous I have seen. You can readily tell that they're handmade. I'm almost tempted to put them on display...lol. I highly recommend this set to anyone into safari deco. Invite this hand-carved, six-piece zoo to your next dinner party to add pizzazz to your table setting. 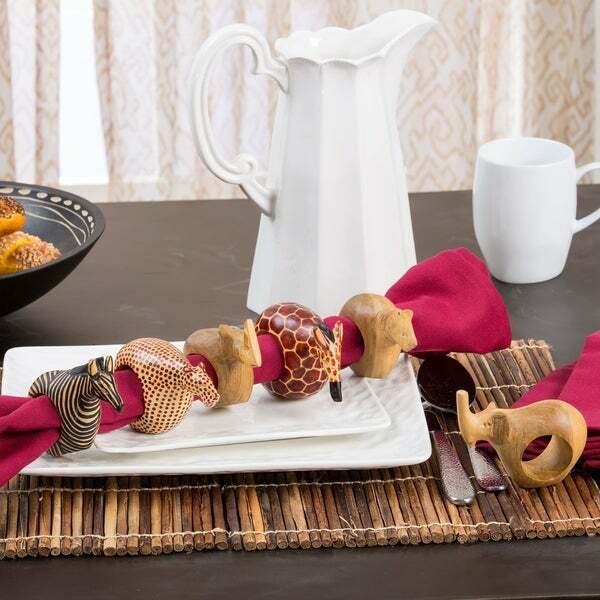 The beautiful and intriguing napkin rings are crafted of genuine African Mahogany using only rudimentary handtools and each one features a different animal: lion, cheetah, elephant, rhinoceros, giraffe and zebra. Working with more than 100 individual carvers in Machakos, Kenya, Jedando Modern Handicrafts markets products primarily made of wood and bone worldwide. Carving is a tradition in Kenya with children learning the craft from their parents. Carved by hand using only rudimentary hand tools, olive wood bowls, salad serving sets, and animal-shaped napkin rings take shape from pieces of olive wood, mahogany, and mpingo, or 'African Ebony.' An integral part of the organization's function is to educate the craftspeople on the need for reforestation to enable the products to be available for years to come and offer a sustainable income for generations. While in Africa I purchased some animal napkin rings. The hole for the napkin is quite small. So when I saw the brightly colored African animals with the large napkin hole I ordered them. They came very quickly. The workmanship is excellent with beautifully carved wood. I liked that there are six different animal rings. Only one of them is hard to figure out which animal it is! I am pleased with this product and would recommend it. We have an African animal theme in our living room general area, so the carved napkins rings depicting six different animals are perfect with our decor. I traveled to Kenya years ago, but did not have interest in decorating with that theme until recently. I'm glad that Kenyans benefited from my purchase. It was a breathtaking trip through Kanya and Tanzania. We brought back several wood carved bowls, frames and other practical gifts. Every time I use one of them, I am immediately taken back to the golden hue of the endless plains on the Serengeti. I have been looking for lovely, elegant napkin rings for my table and came across these hand carved rings. The are beautifully made, some in natural wood, some painted in a natural pigment. They are just as beautiful as anything we bought while traveling. In fact, we'll keep it as our secret. The added bonus is that we are helping local artisans, which is also what we did while traveling. We went to the sheds where the artisans worked, not the typical tourist spots. These napkin rings come with a certification from the Jedando Modern Handicrafts an organization focusing on helping the artisans make a living. I googled it and they are legitimate. I ordered these napkin rings for my son's room. He wants a safari room & I am using these rings to attach his curtains to the curtain rods. I slid the rings over the rod then threaded the curtains along the rod & through the rings. Looks great & he loves it. I am sure these would make great napkin rings as they sit flat & are very detailed. The only negative, if you will, is the fact that only three of the six rings are painted/stained; the other three are simply natural wood. Thanks. I was looking forward to giving this as a gift to someone that appreciates handmade items, this was a big disappointment. Some of the figures were unrecognizable. Most of the carved animals were instantly recognizable but one required scrutiny to figure out which animal was represented. Love them. Satisfied requirement that there be a different ring for each person. Only drawback is that the holes are not large enough for heavyweight napkins. Otherwise fine in every respect. These items are unique and beautifully made. Only one small issue. Two of the six have slightly smaller holes for the napkins to fit through than the others. This is not going to be a major issues as long as we don't choose to use the very large linen napkins. I first saw these napkin rings in the Sky Mall magazine on a recent business trip, and knew someone in my family who would love them! After a little searching around, I found them on Overstock for less (no surprise there). I appreciate the insert that comes in the box describing the story of this art. That detail was most appreciated when I gave this gift over Christmas. She loved them so much that she wanted to know where I got them so she can get a few more sets! Carvings are poorly done. Colors are no where near as bright as picture portrays. I love these in the photo, but they do not look like this in real life. The unpainted pieces are quite dirty and dull, and I do not know yet whether they will improve with washing and oiling. I hope so, but it might require some sanding as well. The painted pieces are nicer, and come closer to looking like the photo. I really wish these looked as good as they do in the picture! I'm really disappointed. Some of the pieces are a little fragile - must be careful when handling. Loved these napkin holders. I have had them for years and people love the whimsical nature of them. They work well and are well made. They will last. I would recommend them highly. I bought these for my sister-in-law as a Christmas gift and found that they were extremely cute in person, didn't see any issues with any of the rings. She claims to really like the napkin rings, so no complaints on this end. Really cute, although I never used them. Thye are just great, very good quality and impressed my guests. Purchased these for daughter-in-law who loves the look and usefulness. They are well-painted and sturdy enough even with a little one in the house who loves to handle everything he can get his hands on. These made for a nice birthday gift to add to an already existing collection of table settings with a safari theme. As a gift. They will love it.